How to make magickWand to use all the available CPU ? I m on windows and using imagemagick 7. Is their any way to optimize magickwand to work in a multithread environment (inside a web server app) ? I'm not sure what you are saying. You are doing the four operations in parallel with each other? I doubt it. The image must be entirely read before it can be resized, etc. How large is the image? Parallelism won't start below a certain size, which depends on how many threads are available. It might help if you paste a minimal program that shows the problem, and link to a sample input image. When imagemagick is configured to use 8 Threads (default) => only one core will be used! When imagemagick is configured to use 4 Threads (updading policy.xml) => ALL the core will be used! You have the same processor as me, with 8 CPUs. You are multithreading a multithreaded application. That is, IM's resize will use multiple threads, if multiple CPUs are available. But you are doing this in multiple threads of your own. If you have 8 threads running then IM's resize will find that no CPUs are available for its own multithreading. Your 8 threads seem to be reading the same file. I don't suppose the lock is exclusive, but this might reduce ability to multithread. I'm no expert on multithreading, but for maximum throughput I think you should choose one multithreading method OR the other, and not attempt both methods. so only on Thread in my app is doing the block (in loop). but i have same kind of problem, when i set MAGICK_THREAD_LIMIT from 1 to 8 only one (more or less) CPU is used and the operation is very slow. loki5100 wrote: when i set MAGICK_THREAD_LIMIT from 1 to 8 only one (more or less) CPU is used and the operation is very slow. That is a common situation: increasing the number of threads has a "sweet spot" with maximum throughput. Beyond that, adding more threads decreases performance. The optimum MAGICK_THREAD_LIMIT depends on many factors: the compiler, the CPU, the code within the thread, and so on. I often find the best performance comes from setting this low (1 or 2), and using other CPU cores by multithreading outside the internals of IM. 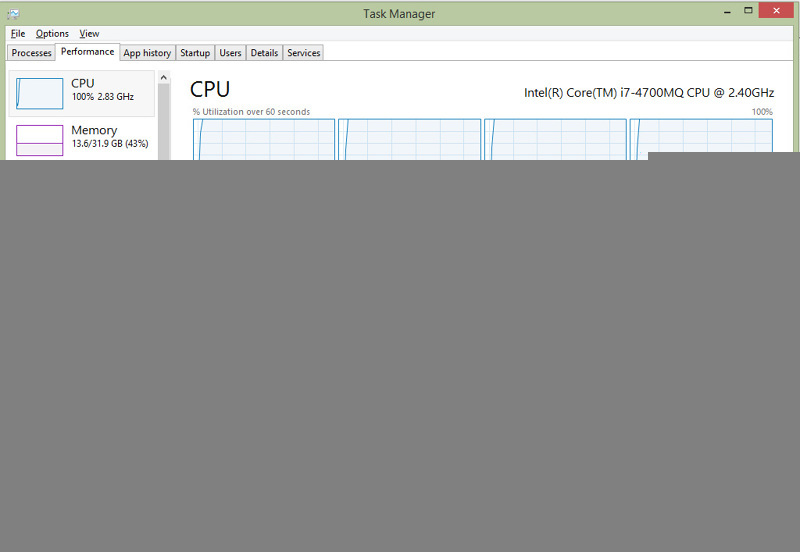 Remember that aiming for 100% CPU utilization is a bad goal. It measures the wrong thing. A better goal is throughput, eg the time required to process 1000 images. IM is greedy. It will use all resources available (CPU, memory, disk etc) unless you tell it not to (with "-limit" or policy.xml).